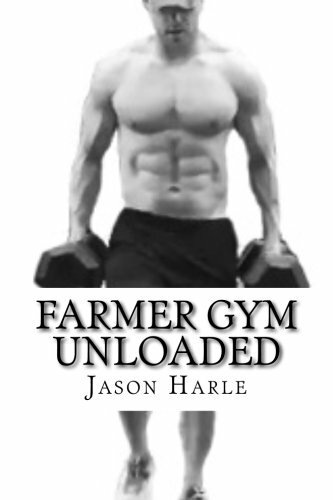 Farmer Gym Unloaded is an 8-week conditioning program designed to enhance one’s overall fitness. Through structured training consisting of weight-bearing, body-weight, and running-based exercises, the program challenges the whole body. The book anticipates that you will work out 4 days a week, perform a steady-state run 1 day a week, and rest 2 days each week. You will proceed through Farmer Gym Unloaded day by day, just as you would a daily calendar. In order to use the book, you must have access to a pair of Dumbbells, a Kettlebell, a Pull-up Bar, and have the willingness to do work. For example: Jane performs 7 Pull-ups, then comes off the bar for a brief rest. Before Jane can execute more Pull-ups, she must perform 15 Kettlebell Swings. And so on and so forth, until the 2 minutes are up. Upon Pull-up—Kettlebell Swing completion, Jane Runs 800 meters. She finishes the Run in 4:30; therefore, she has a 1:30 rest. After the 6 minutes, she begins Round 2. If you scale with Double Dumbbell Rows, it is suggested that you use a weight that can be performed for no more than 15-20 reps in a row.